Warwick offers innovative fabric solutions and military engineering services in the development of inflatable systems for protection and defense. Beginning in the early twentieth century, Warwick's history with military inflatable systems began with the weaving of "Fiber-X" (Nylon), which was used for parachutes in World War II. We also have the capability to develop fabrics and laminates for reentry parachutes, ballutes, evacuation slides, inflatable barriers, inflatable wings, and inflatable fins. Warwick leverages textile competency to provide complete fabric system solutions. We have worked on the training-torpedo recovery float system employed by the US Navy. This program considers reduced environmental impact, cost, and maintenance along with stringent operational requirements. Warwick worked with Natick Soldier Systems Center and Vertigo to develop and manufacture an impact fender for the US Navy. 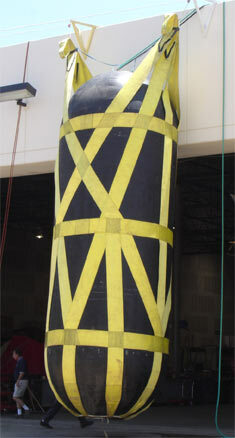 This large inflatable required a very high-strength material to support inflation loads. Warwick fabricated the pressure vessel using proprietary heat-seal technology. Our research and development activities focus on identifying new materials and processes that generate lightweight chemical and biological resistant laminate structures for both passive and active chemical and biological defense. We design multilayer laminates for defense markets using advanced reinforcement fibers such as Vectran® and aramid. Our military engineering services include the development of fabric for, as well as fabrication of, temporary military tents and structures, which act as barriers against passive and active chemical and biological agents encountered by forward-moving military and emergency personnel. Active chemistry laminates not only provide a barrier to active chemical agents (as passive chemistry laminates do) but also destroy such agents.